“Water before a meal is nectar. Proper hydration is important for overall health. Every metabolic function uses water yet the body does not make water. It is dissipated when we breathe, through skin evaporation or sweat and when go to the bathroom. The water content in the foods (fruit and vegetables) we eat and the beverages we drink combine to hydrate the body. Water needs vary depending on the individual’s age, gender, health, activity level, geographic location and temperature. Thirst can be mistaken for hunger, important if you are overweight, pregnant or lactating. Flavour water with slices of citrus, combinations of berries or other fruits and herbs, like mint, to make water more palatable and easily absorbed. 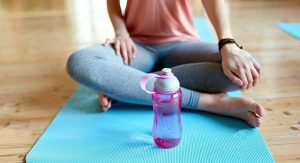 Drink water warm rather than cold (depletes gastric juices, agni fire); before a meal and before yoga (we want to generate some internal heat for purification, flexibility and strength during asana practice – hence it is better not to drink during class). Insufficient hydration fatigues muscles, reduces co-ordination and causes muscle cramps. Colour of urine should be light. Concentrated wastes collect when we are dehydrated and darken urine to deep yellow, gold colour as body tries to conserve water. NB: Intensely coloured foods (such as beetroot), as well as some medications (B vitamins and laxatives) can darken urine even if you are hydrated. Sweat Production: The body uses sweat to moderate its temperature; when body temperature increases, sweat is produced by drawing fluid from the bloodstream. If you are well-hydrated before exercise and continue to drink fluids during activity, you will maintain a relatively constant rate of sweat production and overall higher quality athletic performance. Overall blood volume decrease can lead to dehydration and an eventual cessation of sweating, along with muscle cramps and a dangerous increase in temperature. Normal Skin Turgor: the normal distention or rigidity of cells and tissue, resulting from the pressure exerted by the cell contents on the cell walls. If you are well-hydrated, your skin should have normal turgor, meaning it rebounds immediately after being pinched. Health professionals commonly use this method, known as the skin turgor test, to get a general idea of hydration status. However, it is possible to be well-hydrated and still test poorly due to various other factors, such as smoking, malnutrition or kidney failure. Capillary Refill: Your skin should take less than two seconds to return to its normal colour after blanching when pressure is applied, if you are well-hydrated. This method, called the capillary refill test, is used to identify reduced blood flow in a localized area. With time, dehydration leads to vasoconstriction and reduced peripheral blood flow, increasing the time it takes for skin in areas such as nail beds to return to their normal color. When severely dehydrated, you might have a capillary refill time of four seconds or more.